I know. Thanksgiving is in two days. I know you are frantically searching the web for the perfect turkey brine and sweet potato casserole. But here’s the thing. I’m not cooking this year. So, my mind is already focused on Christmas. And I know there are some of you who don’t live in the US, and don’t celebrate Thanksgiving…so today, this post is for you! 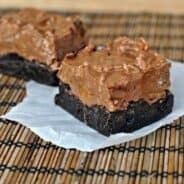 These soft brownie bites are made with hot cocoa mix. And the frosting? It’s Cool Whip Vanilla Frosting. Have you tried this yet? Seriously good. And totally easy. 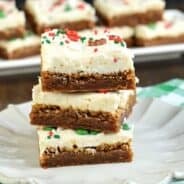 The creamy cool whip is a perfect pair with the hot cocoa brownies. And I think Santa would approve, yes? If you enjoyed this Hot Chocolate Brownie recipe, you may also enjoy these recipes…. Line a 13x9 baking dish with parchment paper. Pour batter into parchment paper. Bake in a 375 degree oven for 22-25 minutes. Remove and cool completely. Oh my gosh, these are the cutest things I’ve ever seen! I hear you…I’m not cooking this year, so I’m totally on to Christmas stuff. 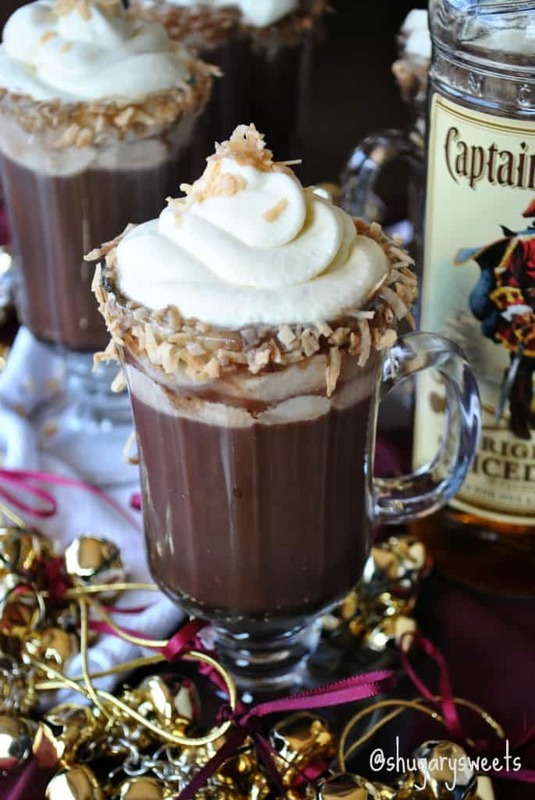 I’m loving these–and I’ve got to get my hands on that Cool Whip frosting. can i please ask what cool whip is as i am in new zealand and we dont have that was wondering what i can use to make these? Whipped cream. Cool whip is a non dairy replacement for it. These are adorable…and it’s never too early for holiday baking! Oh my how cute and I know they are tasty! Thanks Pamela! Glad you stopped by! These are adorable! And I bet really yummy too! Thanks so much for including my hot cocoa cupcakes! Your cupcakes are so adorable, I’m so glad to have found them!!! Thanks for the sweet comment Liz! Liz, I actually thought of you specifically when I posted this…no joke!! 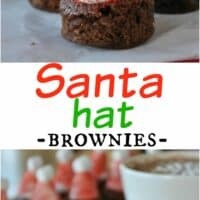 Hot cocoa mix in brownies?! I Love it! Thanks Jess, I was surprised at how good they were too…as I proceeded to eat a dozen! You’re SO creative, Aimee! They’re adorable! Thanks Averie, that means a lot to me!! hot chocolate brownies! are adorably clever Aimee! 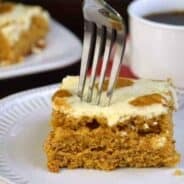 And the cool whip frosting – I have got to try that! the circle shape, the sprinkles, the marshmallow tip. I agree with Averie – you are SO darn creative!! The Cool Whip frosting is simply divine. And you KNOW I love to make my own everything…this frosting is just so creamy, and it stands up to piping! Thanks for the sweet words, Sally! I love that you added hot chocolate to the brownies. I recently made hot chocolate cookies and they were to die for. 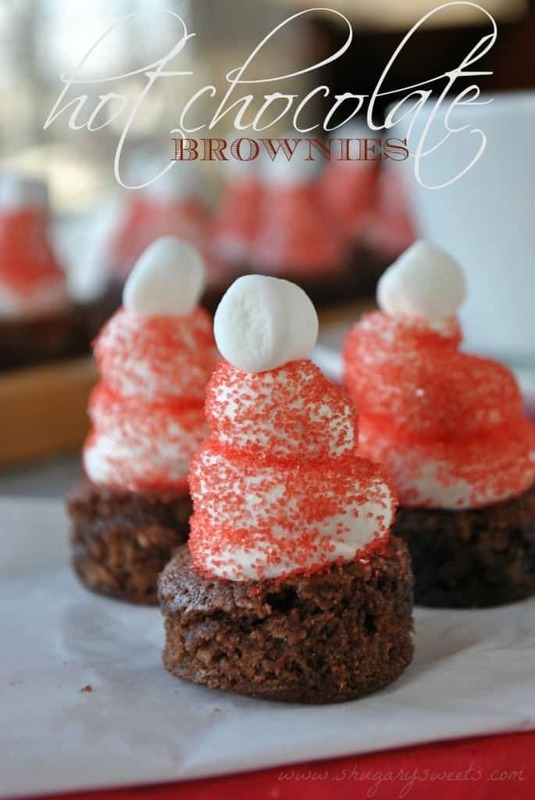 I’ve gotta try this brownie version since these are so darn cute! Btw, where do you find the Coolwhip frosting? I’ve looked at my local grocery store and they don’t carry it yet. I might try Target this weekend to see if they have it! These are so fun! Love the idea of hot chocolate in brownies!! Thank you Jessica! It was a perfect addition. These are SO adorable, Aimee! So genius. I heart Cool Whip! I so need to get that frosting. These are adorable Aimee! These are adorable. Cuteness to the nth degree. 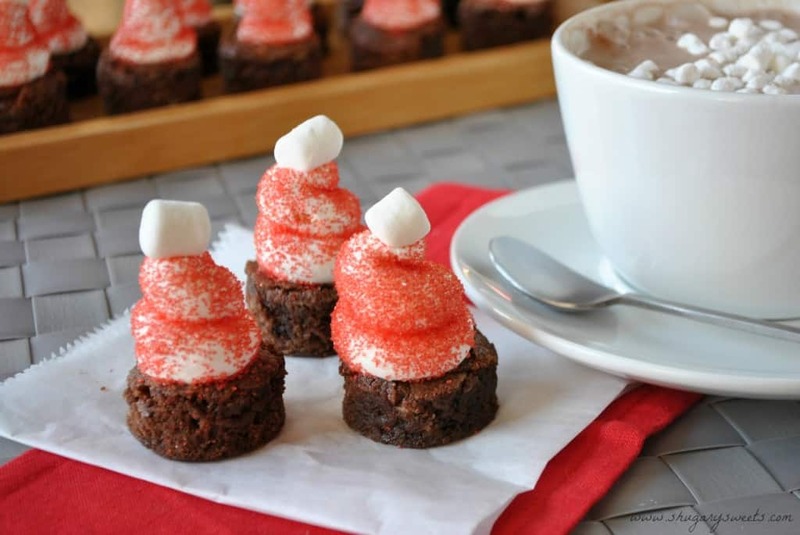 I am loving the tall piped cool whip hat covered in sugar…sooooo stinking cute;-) And hot chocolate in a brownie…oh yeah, that sounds awesome!!! Oh my lanz, I love this idea! These are SUPER cute! These will absolutely be added to my Christmas baking list. I’m going to try to make them vegan as well. This is the best of both worlds, hot chocolate and brownies, and for the holiday’s! YUM! These are just too darn cute! Love brownies, and the idea of hot chocolate with them is perfect! These are absolutely adorable! What a cute dessert idea that also functions as decor!